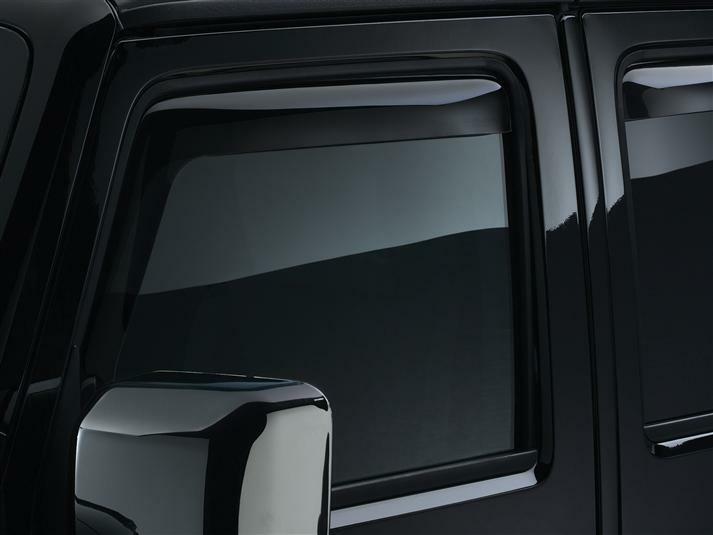 WeatherTech Side Window Deflectors are precision-machined to perfectly fit your 2011 Jeep Wrangler's window channel. These low profile window deflectors help to reduce wind noise and allow interior heat to escape. Our light tinted Side Window Deflectors are the only deflectors in the world made with a D.O.T. (U.S. Department of Transportation) approved glazing material. Available in light and dark tint for most vehicles. Designed and Engineered in USA – Handcrafted in Germany. I was pleased on how well they fit and the ease of installation. The video is accurate, no glue, sticky tape, they pop in and done! I have to agree with Ron from Greeneville, they took longer to get out of the box than to install....in fact once they were in I kept looking them over to see if I had made an error, but no, nothing wrong, just a great product with a great fit. The newer Jeeps seem to get more of a "breeze" with the windows open than the older ones, or maybe it's just me, but these wind deflectors do cut down on that a bit, makes it less distracting at highway speeds. I love 'em !! I can roll down the windows during the summer so the heat does not get so hot inside. And if it rains the inside does not get wet.So easy to install. Love them.Keep up the good work.